We carry Biofreeze products to sell to our patients. Welcome to Mid Maine Chiropractic. With over 30 years experience and 2 convenient locations, Dr. Saulter is dedicated to providing the best service and treatment possible to meet your individual needs. 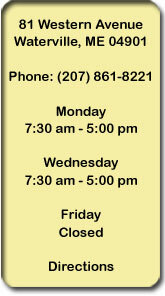 To schedule an appointment please call us today at (207) 861-8221 (Waterville office) or (207) 696-3880 (Madison office). 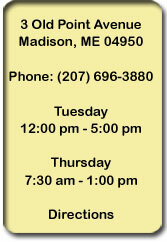 © Copyright 2011-2019 MidMaineChiropractic.com All rights are reserved. Site Designed by: Your Designs Unlimited.